This post first appeared as an article in the Dec 2009/Jan 2010 issue of IHRIM.link, a publication of the International Association for Human Resource Information Management. If you’ve spent any time involved in efforts to select and deploy enterprise technology, it will not come as news to you that technology implementation is hard. A host of research studies over the years show a surprisingly high percentage of enterprise technology failures. The more strategic the technology, the wider the array of stakeholders impacted and the broader the purpose—the higher the risk and the cost of failure. This puts HR software near the top of the list when it comes to potential for disaster. On the other hand, the same factors that cause technology initiatives to be risky also increase the benefit when it’s done right. HR software is also at the top of the list when it comes to the potential for significantly improving the ability of an organization to succeed at its core mission. While technical challenges can be daunting, often failures don’t happen because the technology itself doesn’t work. More often, failures are on the organization side. Poor planning, unreasonable or fuzzy expectations, misaligned business processes and lack of buy‐in from stakeholders are far more likely to bring a project down than technical issues. As a result, change management has become a critical component in technology projects. Without the requisite expertise and staff resources to address change management in a serious way, the prospects for success are not good. However, change management is not enough. The challenges are bigger than what can be resolved during the implementation of a single project. There are literally dozens of distinct formal approaches to change management—over 60 are listed in a recently published book on the subject. These range from “hard” approaches such as Six Sigma with its quantitative emphasis to “soft” approaches such as empowerment that focus on relationships or individual psychology. Regardless of the specific approach used, most change management methodologies share two attributes. First, they are built around a “whole system” view that examines the complex ways that a proposed change affects the interrelated systems and groups within an organization. Second, they encourage meaningful engagement with stakeholders. Change management is good as far as it goes. In theory, it brings people together to build consensus and alignment. But in practice, change management efforts often come too late in the process and involve trying to sell people on decisions that were made without their input and with which they may not agree. In essence, it becomes an effort to gain compliance. And when it does, the risk of failure goes way up. In practice, change management efforts often come too late in the process and involve trying to sell people on decisions that were made without their input and with which they may not agree. The larger problem is not managing change, but generating organizational alignment around objectives, strategy, tools and methods. The approach for addressing this problem is referred to as governance. Governance builds on the ethos of change management. Like change management, it looks at whole systems and fosters meaningful engagement with stakeholders. But where change management focuses on “who” and “how”, governance adds the “what” and the “why”. And where change management typically revolves around implementation of a single initiative, governance begins earlier, takes an enterprise view, asks more strategic questions, draws connections across disparate projects and processes and looks at all stages of the lifecycle for each project. What are the obvious and non‐obvious effects of change on various groups within the organization and on existing people and processes? What’s the right balance of centralization or standardization versus local control? How do we make this a “win” for the people who will be impacted by this change as well as for the enterprise? What could go wrong and how do we make sure it doesn’t? How do business processes from each stage of the lifecycle of the project connect and what are the implications of these handoffs? How will we manage not only implementation, but also ongoing operation and continuous improvement? How does this initiative connect to other initiatives across the organization? While some of these questions might be asked as part of traditional change management, governance distinguishes itself with its focus on alignment with enterprise strategy and by taking a lifecycle view. Where change management focuses on implementation, governance takes a “cradle to grave” perspective. Governance works to identify handoffs and connect the dots between business processes that are done by different people at different times. For instance, the people who manage an online learning library are rarely the people who create the content. Yet if the content creators don’t follow standards for naming conventions, pre‐requisites, revision management and content expiration, effective library management becomes nearly impossible. By looking at the big picture, governance identifies problems and reduces risk. And because many of these problems are intertwined with technology choices and implementation decisions, governance leads to more effective technology initiatives. Governance happens at many levels. There is project level governance, department or regional governance and enterprise governance. The larger the governance umbrella, the greater the impact on the organization. Enterprise governance doesn’t happen over night. But keeping an enterprise perspective even when starting out with smaller governance domains pays off in the long run. The goal is for small governance efforts to expand and eventually connect into an enterprise level governance model. One way to push enterprise level governance along is to draft a “straw man” enterprise level governance model. An enterprise governance model typically consists of governance bodies at different levels of the organization. These bodies often take the form of councils: decision‐making bodies which may delegate topics to committees or centers of excellence to be fleshed out. Each council has a charter describing its responsibilities, objectives, members and operating procedures. While councils are primarily composed of leaders from various stakeholder groups, it is a good practice to include worker level representatives from key groups to get the broadest possible perspective. 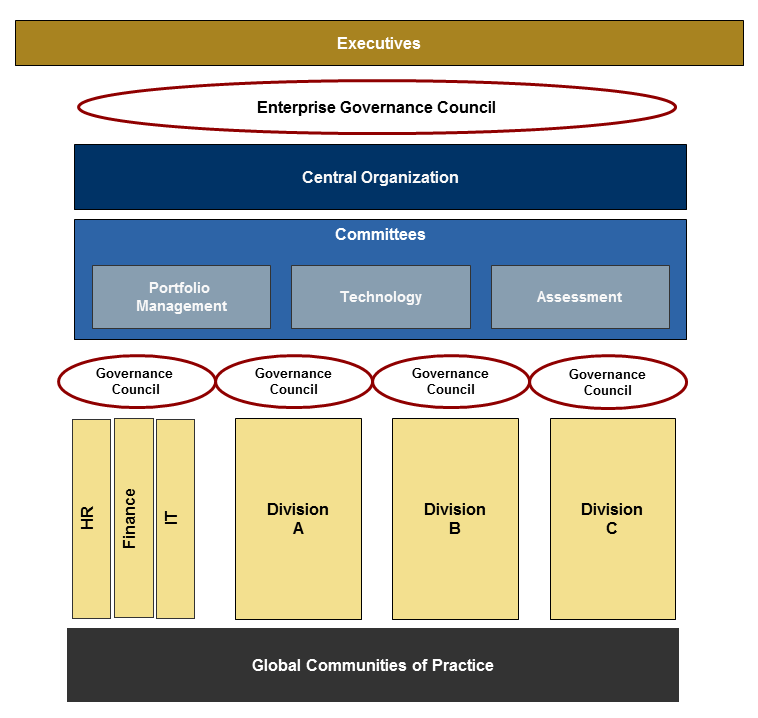 A governance model can be represented in a diagram that shows the various governance bodies along with their relation to each other and to the various divisions and regions in the enterprise. Here is a sample diagram for learning governance. While this diagram is typical of what governance might look like in a large, decentralized enterprise, there is no “one size fits all” when it comes to governance. Governance will look different in each organization. In fact, one of the most critical success factors is that the governance model must match the unique culture and objectives of each organization. Putting a highly‐structured, authoritarian governance model in place in an organization with a history of decentralization and local autonomy will do more harm than good. Organizations do not turn 180 degrees in a single step. It is better to find the next logical step based on a realistic assessment of where the organization is now. Looking at a governance diagram such as the one above can give the impression that governance is a top‐down phenomenon. In the real world, that is rarely the case. Governance initiatives are most often driven by the middle layer of an organization—Directors, Senior Directors and Vice Presidents. Mid‐level leaders are in a unique position with respect to governance. They are privy to the concerns and objectives of top executives. But they also have visibility downward into operational and business realities where the work gets done. Obviously, executive‐level support is needed for governance initiatives. However, this support is often obtained by insightful mid‐level leaders making the case for governance and pitching the payoff to the organization. Because governance is frequently driven by the middle level of an organization, it is important that the governance structure have formal process links both upward to executives and downwards to business units and workers. The upward links ensure alignment with enterprise and executive priorities. The downward links ensure that changes and initiatives will fly in the real world. These links might take the form of councils, for instance an enterprise level council and a series of regional or business unit councils. But there are other ways of creating links. For example, in the case of downward links, a link might take the form of an account services model where members of the central team are assigned as advocates for their “customers” within the enterprise. Local decisions that make complete sense from the perspective of one part of the organization may not roll up into the most effective use of resources for the enterprise as a whole. 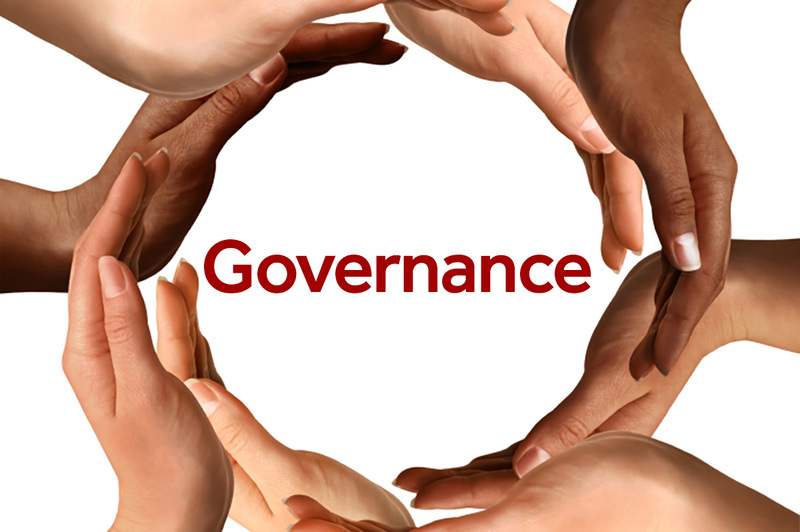 In practice, governance work often revolves around a handful of crucial issues. One of the most critical is creating the right balance between centralization and local autonomy. Creating enterprise standards, shared services and aligned business processes can greatly increase organizational efficiency and effectiveness. But forcing standards where they don’t fit or glossing over genuine local differences can be disastrous. Since technology is where decisions become operational tools, the issue of local versus enterprise needs, along with decisions about which processes to standardize, often plays out within technology initiatives. If you are caught implementing an HR system before these issues are thoroughly resolved, no amount of change management will salvage the project. Another common area of focus for governance is enterprise level planning and resource allocation. Local decisions that make complete sense from the perspective of one part of the organization may not roll up into the most effective use of resources for the enterprise as a whole. Without a consistent cross‐silo process for looking at resource allocation, there is bound to be redundancy and wasted resources from an enterprise perspective. Effective governance helps reclaim those wasted dollars while improving overall organizational performance. Experience shows that governance works best when it is approached from the top and the bottom simultaneously. Since the essence of governance is to increase and institutionalize meaningful interaction among stakeholders, anything that builds bridges across silos—business units, regions or job functions—contributes to better governance. Formal efforts to create enterprise governance bodies should be combined with grass roots efforts to increase communication within the organization. Communities of practice, focus groups, social networking and a variety of other techniques that strengthen connections between stakeholders create and reinforce a culture that supports governance. Frame the participation of stakeholders as an ongoing opportunity to provide direction—a day-to-day philosophy rather than an activity associated with system implementation. The similarity in perspectives between governance and change management provide a useful avenue for moving toward governance. Start by broadening and formalizing existing change management efforts. For instance, create a project‐level governance council around a particular project. Give participants more say in decision‐making. In the case of technology projects, jointly design business processes, user interface and other key elements. Reach out to stakeholders who have not been represented in the past. Take stakeholder concerns seriously and find a way to address them. If a system will require stakeholders to make changes that may be viewed as painful, find ways to create “wins” for these stakeholders so they have something to gain from the project to compensate. And perhaps most importantly, frame the participation of stakeholders as an ongoing opportunity to provide direction—a day‐to‐day philosophy rather than an activity associated with system implementation. As governance at the project level begins to make a positive impact, it will naturally create momentum for a more in‐depth look at broader governance opportunities. The same is true if you start your governance effort with a department, business unit or region. Success breeds success. If you employ governance best practices, you will improve outcomes. When these improved outcomes become visible, people in the organization will begin to connect the dots on how they were achieved and enterprise governance, as a concept, will take root. Governance does not eliminate the need for change management. In fact, governance reinforces and expands change management efforts. Doing change management without a clear strategy and broad consensus on a course of action is typically an effort in futility. It’s like being responsible for marketing a product that doesn’t work. No matter how well you do your job, the prospects for success are slim. With governance, objectives will be clearer, decisions will be better attuned to reality and a broad consensus for action will exist before implementation starts. That will make change management efforts really pay off. And it will reduce the risk of you becoming a technology failure statistic.